1. I can just control the volume, i cannot skip tracks. Either using my bluetooth headphones (Sony SBH80, Samsung U) or my car controls. 2. The car display cannot read the album\songs tags. 3. The functions above works with the music player from Huawei, on Spotify or Deezer. They also used to work on my previous phone, which used an older version of Android (marshmallow). So in short the only thing i believe is different is the phone android version, or do you have any suggestion? This will not be fixed in the v2 builds (which will become legacy products for pre Android 5 devices only) but shouls get fixed at some point for the new v3 release. You could try the most recent alpha build 704, but I think this particular issue may still be present on that version too as it predates your phone's OS. 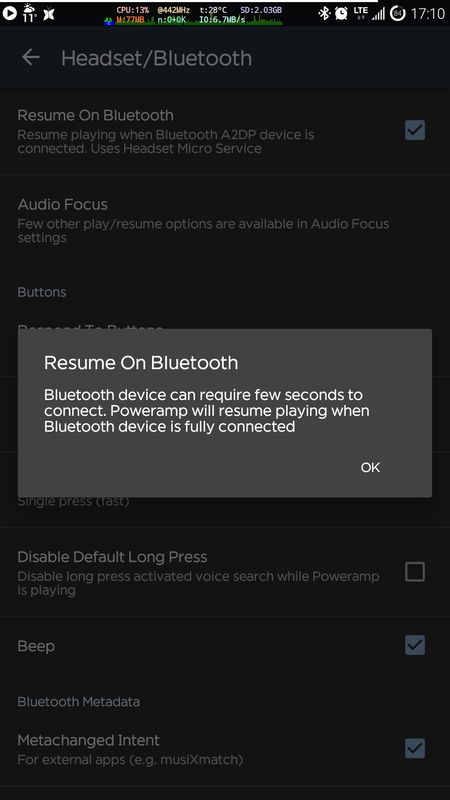 Settings > Headset/Bluetooth > Resume on Bluetooth. You will activate a service that listens for controls outside the app. Poweramp 7.04 alpha, on android 7.0 Nougat, Exynos S7 Edge, with Sennheiser Momentum 2 AEBT.